This backpack isn't just an ordinary drawstring backpack - there is a twist! 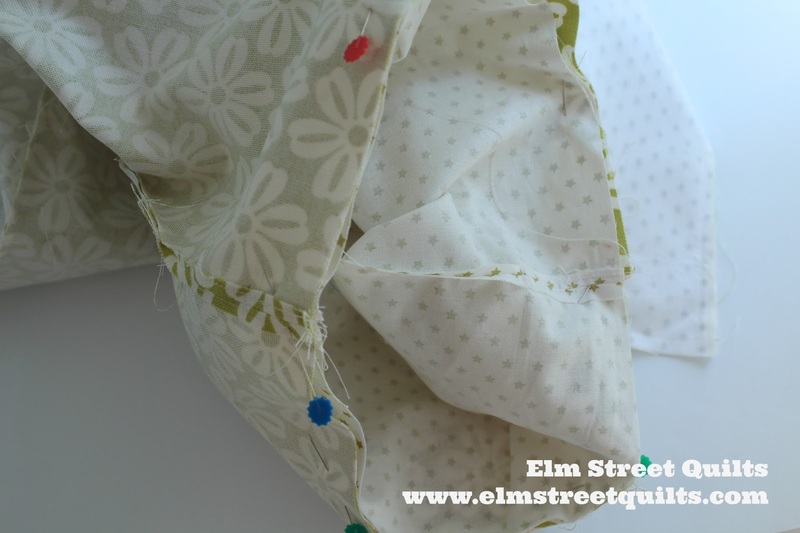 The twist is a hidden pocket in the side seam. My phone fits neatly inside and is nice and secure. A pdf version of the Elm Street Quilts Draw String backpack is also available. Note - for directional prints the measurements are listed as height by width. So you'll need a piece 17 ½ '' high by 13 ½ '' wide. Note - numbers in ( ) refer to the photo below. Also reference grommet tutorial. Install grommet according to directions on grommet tool. I used a large flat rock outside my home to rest the base tool on. Wear safety goggles and take care when using hammer. 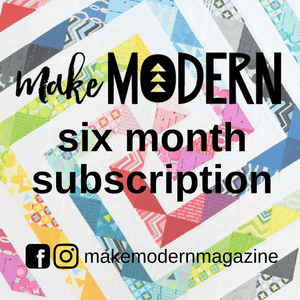 Repeat for second grommet tab unit. Photo (9) above shows how grommet tab will look once installed into bag. Grommet tab unit should now measure 2 ½ x 2 ½ ‘’. 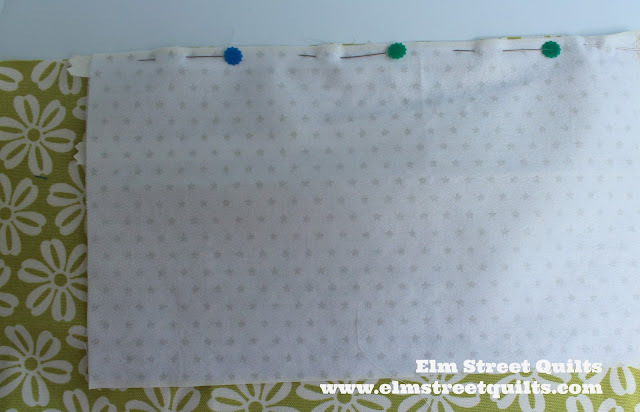 Right sides together, sew side seam on both sides of lining fabric. Sew seam across bottom, leaving a 3-4'' gap for turning. Iron lightweight interfacing to the wrong side of each of the pockets for extra stability. 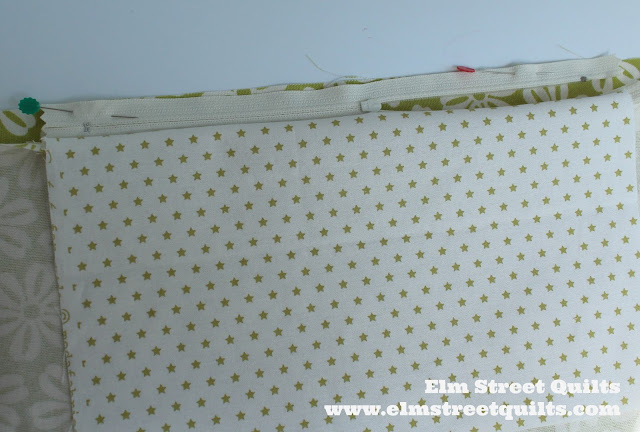 Iron medium weight interfacing to the wrong side of both primary fabric pieces. 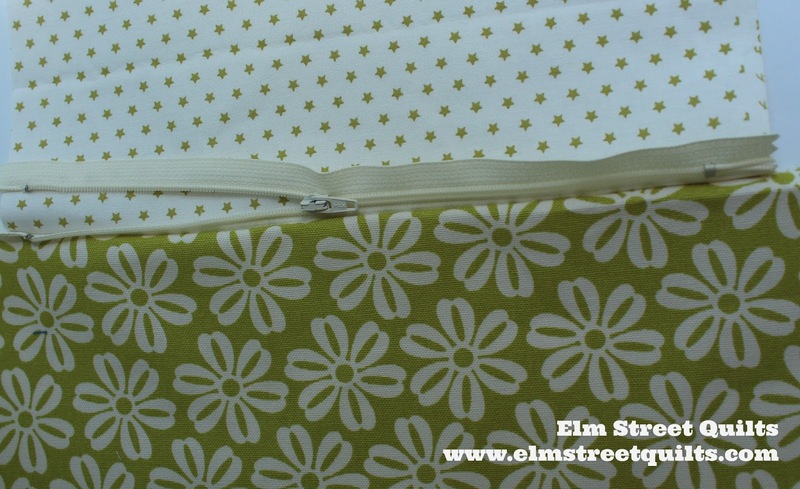 on the left side, measured from bottom edge, line at 3"
Open zipper and lay right side down against right side of fabric. 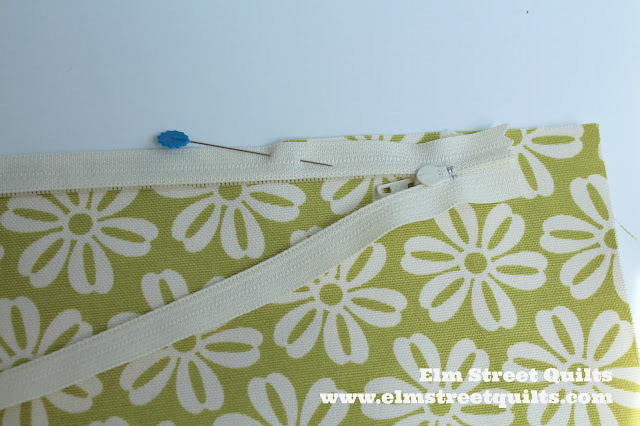 Align bottom of zipper tape to the line marked on fabric. Secure top and bottom of zipper each with a single pin. Lay pocket over zipper (right side down). The bottom of the pocket should align with bottom of zipper tape. 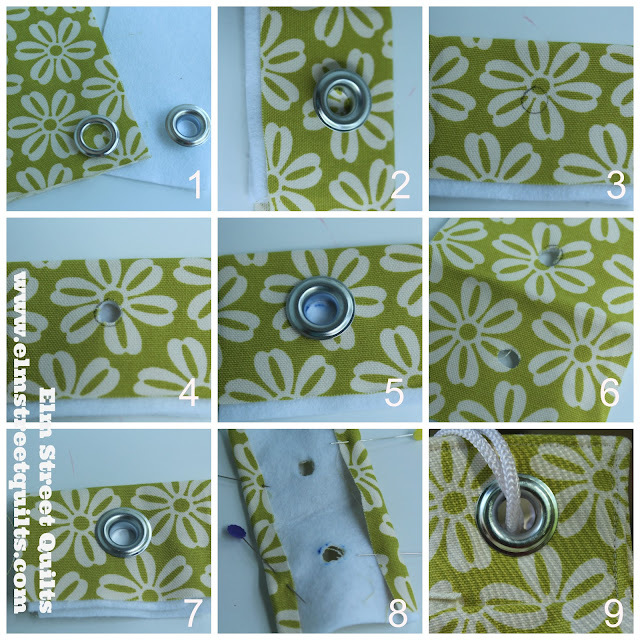 Secure pocket, zipper and fabric with pins. Sew along pocket edge to secure zipper sandwiched between pocket and front panel. 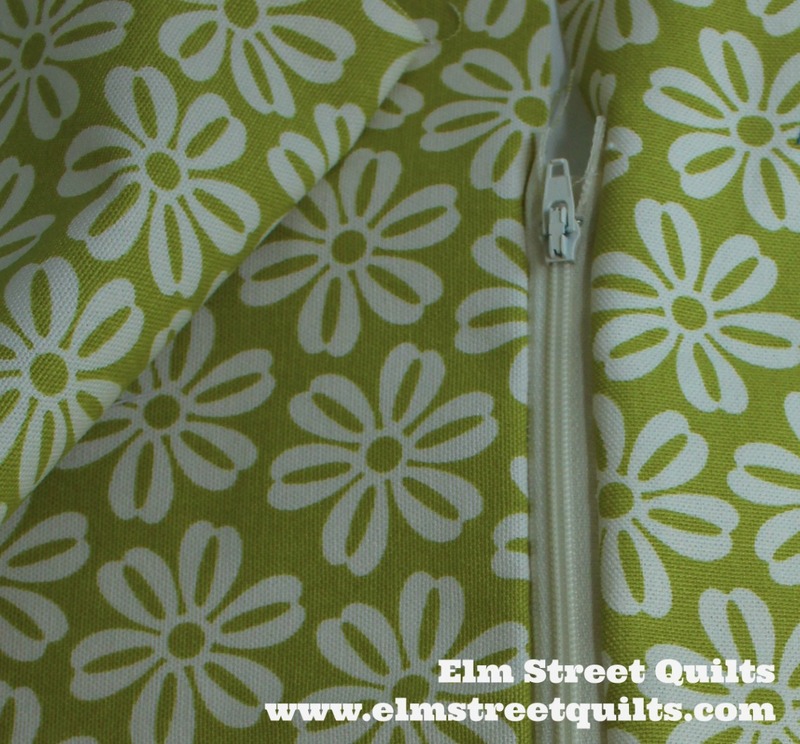 Repeat for second side of zipper attaching it to the second primary panel. The zipper is now tucked into the side seam. 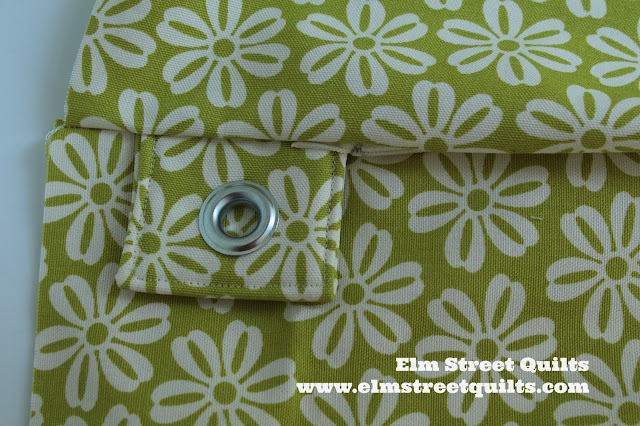 Place grommet tab such that it is nestled right to the bottom of the zipper stop. The tab will also end up sandwiched between the very bottom part of the pocket and the finished edge of the grommet tab is aligned to the 1'' mark. 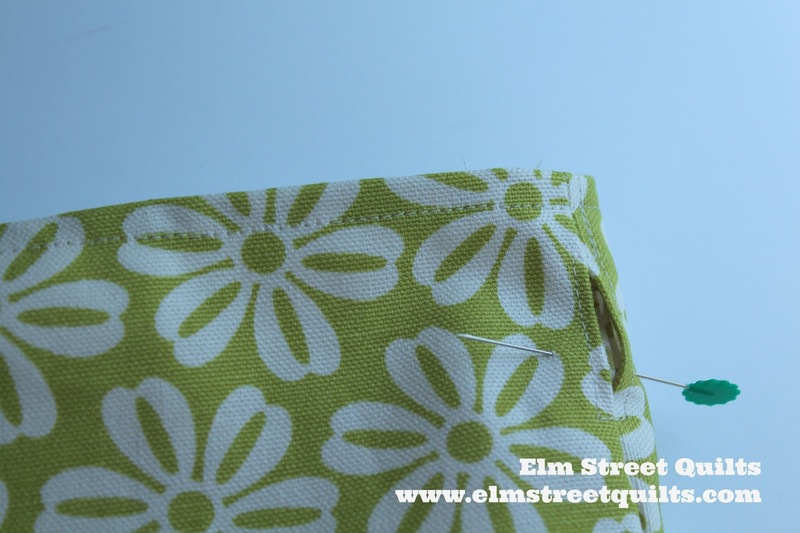 Sew side seam from bottom of zipper to bottom of bag to secure grommet tab. (See diagram below). Pin pocket edges. Sew pocket seam and top side seam as shown in diagram, leaving a gap between the marks made at 1'' and 2''. 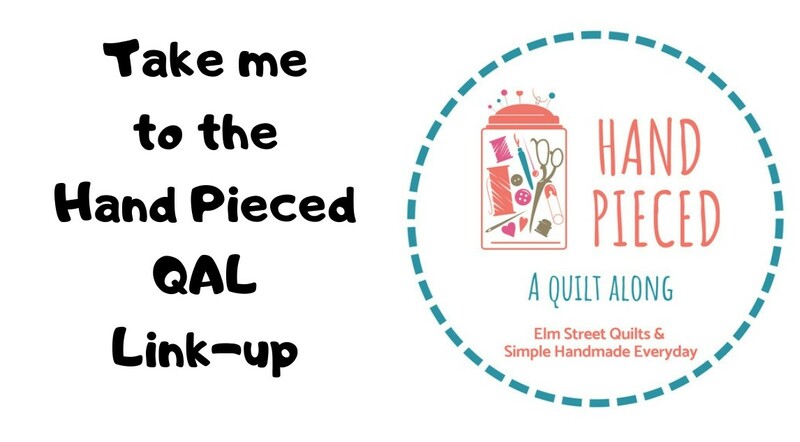 As you sew close to the top and bottom of zipper, proceed cautiously so that you don't strike zipper stops. Pin edge of grommet tab 1'' from bottom of other side of bag. 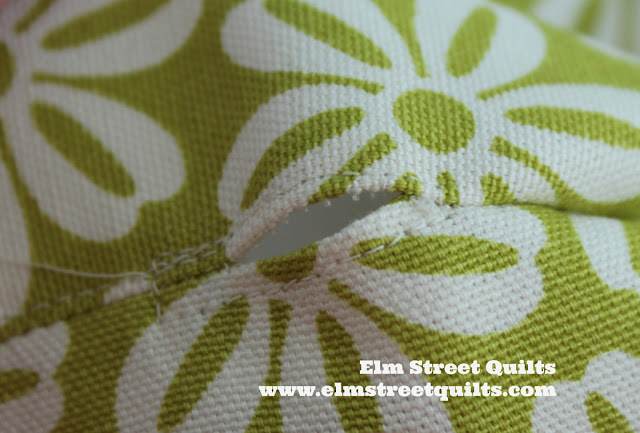 Sew side seam , leaving a gap between the marks made at 1'' and 2''. 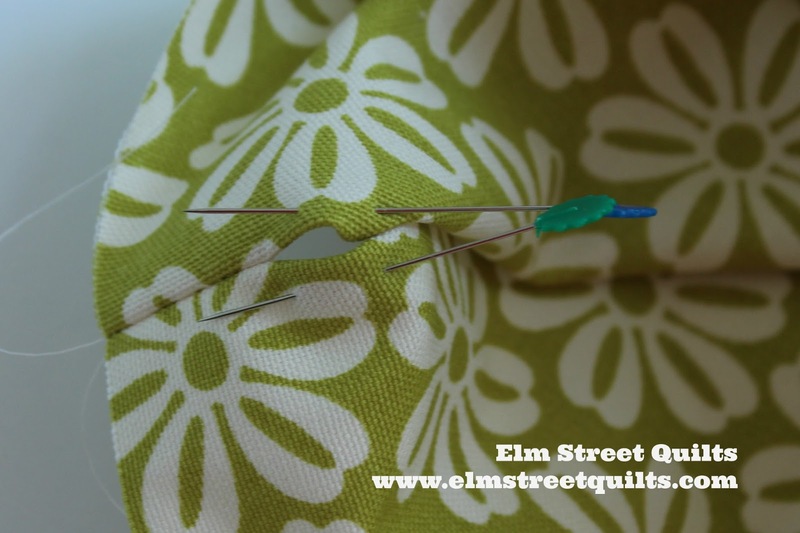 Sew across bottom side seam. If you look carefully at the photo below, you'll see a bit of the zipper tab will show. I was fine with this so didn't fuss with a way for that not to happen. Another view of side seam with zipper. 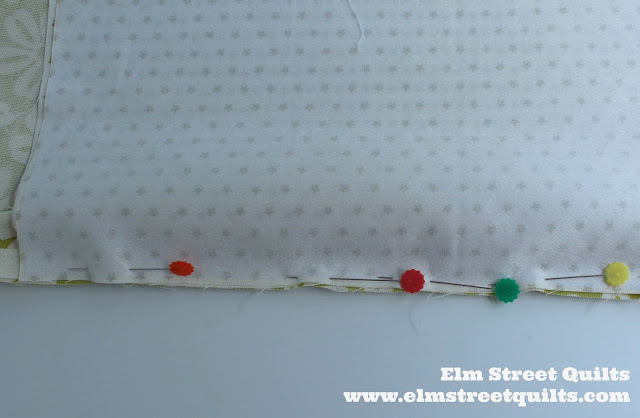 As with lining, finger press seams open around the opening for the cording. Sew around opening to secure. Nest the lining fabric inside the outer fabric, right sides together. Make sure the side seams align as do the openings for the cording. Top stitch 1/4'' from top. Sew a second line of top stitching slightly less than 3/4'' from top and a third line of top stitching 1 1/2'' from top to create casing. Take one piece of cording and thread it through casing starting at the side that has the zipper in the side seam. Feed these through the entire casing around the entire bag. 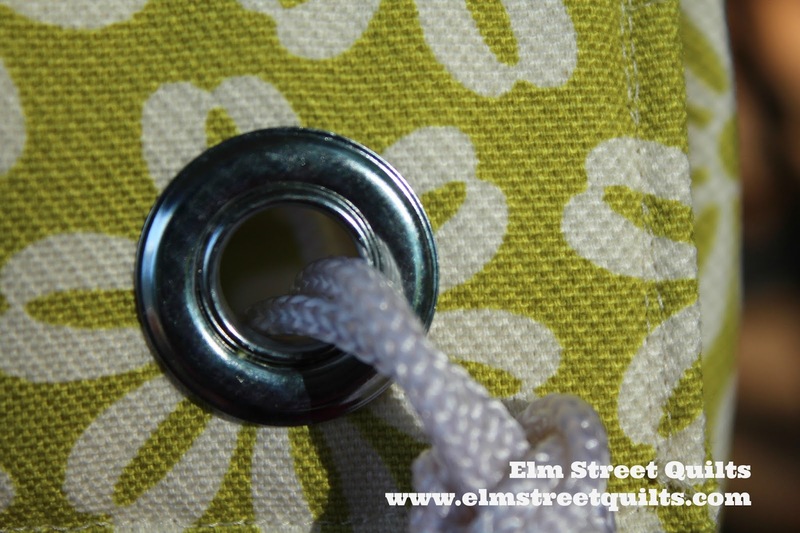 Align both ends through grommet. Tie a knot large enough to ensure it won't slip through grommet. 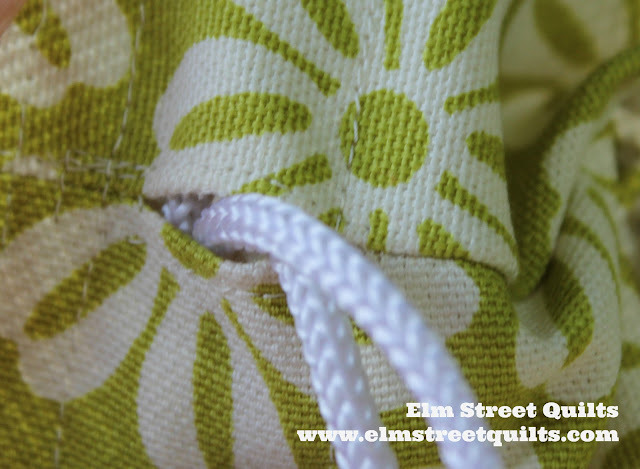 Repeat using second piece of cording entering the casing from the side seam that does not have the zipper. Close opening in bottom of lining by hand or by machine. 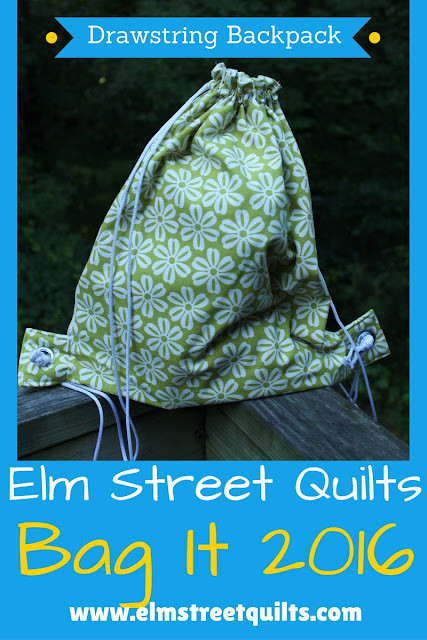 A pdf version of the Elm Street Quilts Drawstring Backpack is available. The hidden pocket is genius! Great tutorial, thanks! What a clever idea! 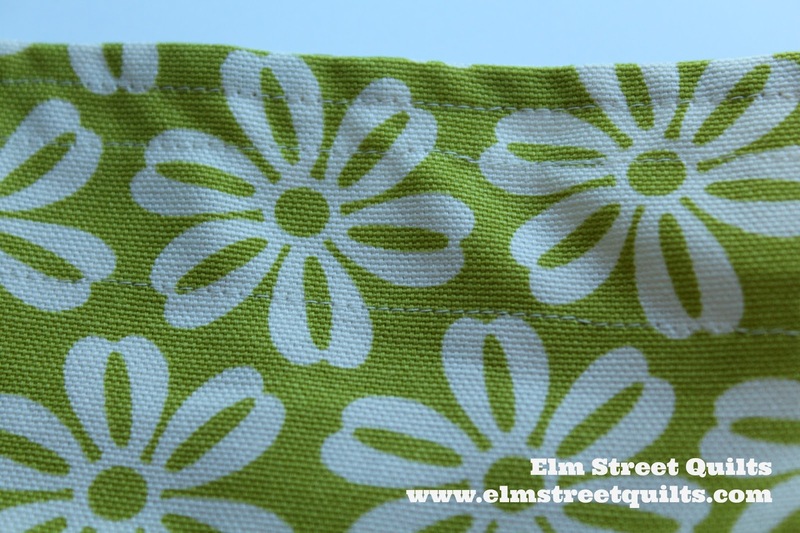 I don't tend to make bags, but the ones I can seem to handle are simple drawstring bags and I will definitely come back and consider using this tutorial in the future. Thanks for linking up! A great bag and excellent tutorial! 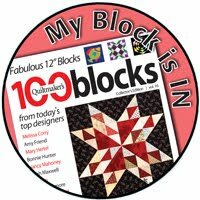 A gorgeous bag and a really comprehensive tutorial - thank you! Very fun and useful. The tutorial is great too!